YORK, PA -- There is an old saying. "Man works from sun to sun, but woman's work is never done." However, one man in Pennsylvania is challenging that statement and proving his job as a father is never done - even after he has worked from sun to sun. Andre Palmer was exhausted after working third shift all night, but when his shift ended he continued to work on the most important job in his life - being a dad. Palmer's 20-month-old son was in the hospital and he went straight to his child's bedside when he got off work. "I thought to myself after working all night he didn't have to come to the hospital," said Palmer's wife, Amy. "He could have went home to sleep." Amy Palmer said her son's room at York Hospital Pediatrics included a crib and a sleeper chair. She was asleep in the chair when her husband entered the room. A powerful photo of a dad cradling his sick son in the shower has gone viral, despite being removed by Facebook. Heather Whitten snapped the photo of her husband, Thomas with her son Fox and posted it on Facebook. "He could have asked me to get up, but he didn't because he knew how tired I was," said Amy Palmer. "He's a great man." 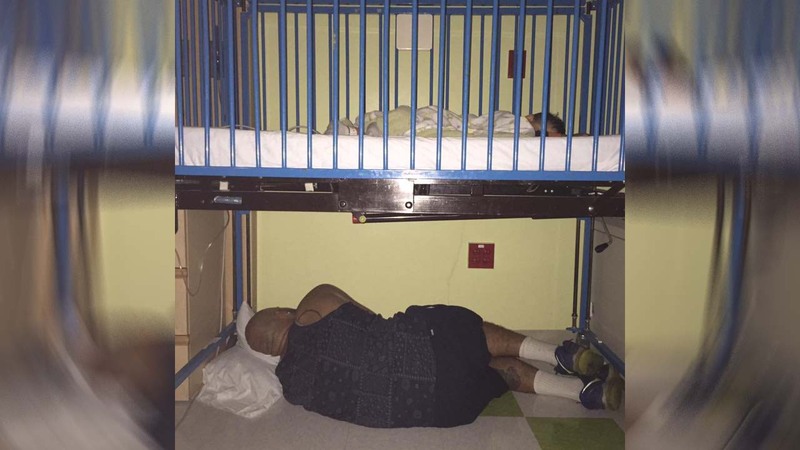 When Palmer woke up and saw her husband sleeping under her son's crib - she snapped a photo and posted it on Facebook. The photo received more than 1,000 likes and Palmer said she is overwhelmed by all the support the family has received. "I am so glad that this touched so many people," said Palmer. In case you were wondering, Palmer didn't leave her husband under the crib for too long. The Palmers' son has since been discharged and is now back at home.